Working at height remains one of the biggest causes of occupational fatalities and major injuries. Cases commonly involve over-reaching, over-balancing or the failure of a fragile surface. Falls from height can also be due to unguarded holes in floors such as hatchways, inspection holes and pits, and from falls into process tanks and machinery. Other significant hazards associated with working at height include falling objects and the potential for a working platform to collapse or overturn as well as contact with overhead electrical services. The exact height at which employers have to implement controls will vary from country to country, but generally, work at height can be taken to mean any work where, if there are no precautions in place, a person could fall a distance liable to cause personal injury (through a fragile roof, for example). It should be remembered that access and egress to a workplace could also constitute working at height. Workers in maintenance and construction are particularly at risk, but many other people in a variety of jobs could also be at risk of falling from height. Such professions include: painters, decorators and window cleaners and those who carry out ad hoc work without proper training, planning or equipment. Whatever the task, any working at height needs to be planned in advance, with careful consideration given to the selection and use of work equipment and means of escape in an emergency. Work at height (where unavoidable) should preferably be carried out from the safety of a platform with suitable edge protection in place, but sometimes this may not be possible. In such situations, a ladder may have to be used; however, ladders are best used only as a means of gaining access to and from a workplace. They should only be used at a workplace for light work of short duration and only after careful hazard identification, risk analysis and planning. If a fall from height does occur, the consequences will depend on many factors such as the distance fallen, the nature of the surface landed on, how the person lands and the age and health of the individual. The severity of the injury is increased for example, when the fall is into the path of a moving vehicle (or machinery) or into a tank which contains a hazardous substance. Where possible, working at height should be avoided, usually by carrying out tasks from the ground. Some practical examples include using extendable tools to remove the need to climb a ladder. Other examples include the installation of cables at ground level, lowering a lighting rig to ground level or assembly of edge protection on the ground. For example, an existing flat roof with permanent edge protection may be used for work at height activities. When carrying out such roof work, fragile surfaces present a significant risk – no person should pass or work on or near to a fragile surface unless it is not reasonable to carry out the work elsewhere. Prominent warning signs should be posted at any location where persons may pass near to or work on a fragile surface. Where there is no suitable existing safe place to work from, work equipment or other measures to prevent falls should be provided such as access equipment fitted with guard rails. Independent scaffolds, tower scaffolds and mobile elevating work platforms (MEWPs) are examples. Where the risk of falls cannot be prevented, work equipment or other measures to minimise the distance and consequences of a fall (should one occur) need to be provided, e.g. fall arrest systems, safety netting or air mats. This equipment does not stop people falling, but minimises the potential injuries if they do. Safety nets should be manufactured to recognised standards and may be designed to catch falling personnel or falling materials. They should be erected as close as possible to the work – the further a person may fall, the larger the net needs to be. The use of safety nets is normally limited to high level work such as roof work and steel erection. If the net is too close to the ground it won’t be able to safely accommodate the deflection arising from the impact of a falling person. Safety nets should be erected by competent persons able to ensure that the net tension will allow the safe catching of a falling person, that the supporting framework can withstand impact or shock loadings, and that it does not in itself present a hazard to falling persons. Air bags tend to be used where there is insufficient height to accommodate a safety net or to provide anchorage for a fall arrest system. The strength of the material and the air pressure within the bag are critical to ensuring the safety of a falling person. Because of this, they should only be installed by competent specialist suppliers. Where harnesses are used they must be securely attached to a sufficiently strong anchorage point, and checks made to ensure that they’re always worn. This requires user discipline and active management monitoring on a regular basis. For inspection and short-term lightduration construction work where access from a working platform is not practicable, rope access techniques (abseiling) may be implemented. In this instance, equipment should only be erected and used by competent persons and should be given a comprehensive inspection before use. A single suspension point should not be relied upon to ensure a safe descent. Wherever possible, separate suspension points should be used for the main rope and the safety rope. Tools required for the work should be tethered to the operator so that they can’t be dropped and if necessary, the area beneath the work should be fenced off or covered. In addition to the controls set out above, measures to reduce the risk of a fall should be used, e.g. information and training, use of competent persons, regular ladder inspections, demarcated areas to provide a warning, adequate lighting, good housekeeping measures, use of suitable footwear and checking weather conditions, etc. Consideration must also be given to the safety of people who work or pass beneath the work at height activity. In particular, measures should be in place to protect them from falling objects. In the first instance, steps should be taken to prevent the fall of objects or materials, e.g. toe boards and sheeting on scaffolding. Where this isn’t reasonable, measures should be implemented to ensure that persons are not struck by falling objects, e.g. barrier off danger areas below and prevent unauthorised access. Chutes may be used to control the transport of materials and waste from a height to a safe location. The risk presented by falling materials and objects can also be reduced if they’re stored and stacked in such a way that they are not likely to fall and cause injury. This is particularly important when goods are stored and retrieved at height, such as in a warehouse. Storage racking and shelving should be sufficiently strong and stable for the loads that they will need to support. Racking systems may be lightweight in nature and therefore may be unable to withstand significant amounts of wear and tear. It is therefore important that operators of workplace transport are adequately trained and competent in order to reduce the potential for damage that may be caused by collisions. Damaged racking and shelving may be substantially weakened, even if supporting less than their normal working load. Even before work at height begins, there is much to be considered – not least the selection of equipment and the method to be used. When selecting equipment for working at height, employers must provide the most suitable equipment appropriate for the work. They must also take account of working condition factors such as the weather and the nature, frequency and duration of the work, as well as the risks to the safety of everyone where the work equipment will be used. There are many different types of work at height equipment available, including the following. Powered vertical lifts which are appropriate for raising workers and materials to the required height whilst providing a safe working platform (with guardrails) to work from. These types of MEWPs, commonly known as “Cherry Pickers” are designed to work in a variety of places and can evade obstacles by deviating on a vertical plane. A suspended access system includes a working platform or cradle and a means of raising and lowering it from a roof rig. Systems may be designed whereby they can only be lowered and raised vertically, or where the roof rig permits the cradle to traverse the façade of the structure. A temporary installation is one which is dismantled after use, whereas a permanent installation remains on the structure whether or not the cradle is suspended. Cradles may be raised and lowered manually by pulley blocks or by a powered winch. Cradles should be carefully selected to ensure they are suitable for the intended task. They should be installed by competent workers and be thoroughly examined and tested before use. Workers must also be competent to use or work from a cradle. Even where precautions have been taken, accidents can still happen, e.g. if a motor of a powered cradle fails, it can make the cradle tip or people may overbalance and fall while reaching out of the cradle. 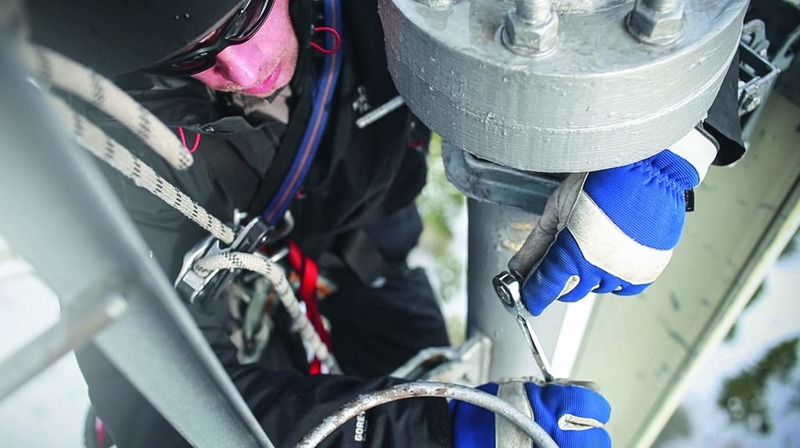 Safety harnesses should be worn and attached to suitable anchor points and thorough visual pre-use checks carried out (in addition to regular inspections/ examinations by a competent person and a record made). A work restraint, fall prevention system, adjusted or set to a fixed length that physically prevents the person from getting to the place where they could fall. There should be safe access to the scaffold, consisting as a minimum, of a tiered ladder. Handrails and toe boards should also be present. Scaffolding should be designed, erected, altered and dismantled by competent persons. Commonly referred to as “Mobile Access Towers” or “Mobile Scaffold Towers” these assemblies are usually made from pre-fabricated components of aluminium alloys or fibreglass. A wide range of such prefabricated tower scaffolds are available. Frequently used for light-weight work of limited duration, they’re involved in numerous accidents each year, usually because the tower isn’t properly erected or used. The potential for overturning, especially with lightweight aluminium scaffolds, is a significant hazard, as is collapse, which can occur if the tower is not properly erected with all parts in place. Towers should be erected by a competent person, in accordance with the manufacturer’s instructions. Instructions should give sufficient advice on the erection sequence and bracing requirements to ensure the stability of the tower. To ensure stability, the tower should rest on firm level ground with the wheels or base plates properly supported. The tower should be checked to ensure that it’s fully vertical before use. A tower on base plates is more stable than one on wheels and should be used in preference to a wheeled tower when there is no need to move the tower. If a wheeled tower is used the wheel brakes should be locked on before use. In these cases, extra support or alternative height-to-base ratios may be needed. In any instance, the base can be broadened by the use of outriggers or stabilisers, reducing the ratio of height to base and improving stability. Stability can also be improved by tying the tower into the adjacent structure. A safe means of access and egress to and from the work platform should always be provided. The end frames of the tower should not be climbed unless there is an appropriately designed built-in ladder, or a purpose-made ladder has been securely fitted on the inside. More appropriate ladder access is provided by a fitted ladder inclined within the tower, providing a route to the work platform via a lockable ‘trap door’. The storage of materials and equipment on the working platform should be kept to a minimum. The platform should be fully boarded out and should normally be provided with suitable edge protection comprising guardrail, toe boards and intermediate rail or brick-guard. Mobile towers should not be moved when there are people or materials on the upper platforms or in very windy conditions. Checks should be made for overhead obstructions, especially power lines, and on the suitability of ground conditions. The tower should be pushed or pulled manually from the base and under no circumstances should a tower scaffold be towed by a powered vehicle. In order to prevent people from walking into the work area, barriers should be positioned around the tower whenever they are used in public locations. Every year many people are killed using ladders. Many of the accidents occur because the ladder is not properly secured, usually because the work was of very short duration. Other typical accidents include falls as a consequence of over-reaching or overbalancing, or due to losing hold of the ladder when carrying loads up it. As discussed, ladders should be primarily regarded as a means of access to a work platform, rather than as a workplace. Ladders may, however, be used for work that is short term, light duty and low risk, or where the site features will not accommodate a working platform (provided that a safe system of work can be devised). Work that requires the use of both hands or is in itself inherently dangerous e.g. hot work, should not be conducted from a ladder. The length of the ladder also has a significant bearing on its suitability, it must be long enough to allow an inspection or task to take place without over-reaching, and also to provide a safe means of egress if necessary at the top landing. The longer the ladder, the more difficult it is to carry around site and manoeuvre into position. The material of construction may also be significant. As timber is nonconductive it will prove to be a more suitable material than aluminium where electrical equipment is being used. Aluminium ladders may be damaged in corrosive atmospheres, whereas timber ladders are prone to warp if left exposed to the elements. Although stepladders provide a freestanding means of access, they require careful use. Usually, stepladders aren’t designed for any side loading and therefore, can be easily overturned. Fatal accidents have occurred when workers have stepped on to the top step of a stepladder, which has subsequently toppled over. Therefore, the top step of a stepladder should never be used at a workplace unless guidance from the manufacturer states that the equipment has been designed for this purpose. Stepladders should be industrial grade, be used on a level surface and with the hinge fully extended and locked (or retaining cord fully extended). The workers’ knees should be below the top of the ladder when in the working position. Ladders and stepladders should be inspected before each use to ensure that they are suitable for the job, and in good condition. Damaged stiles, damaged or missing rungs or missing feet should exclude the ladder from use. Painted ladders should not be used as the paint coating may conceal faults. Ladders should also be periodically examined by a competent person – management systems are necessary to ensure all ladders can be individually identified, are properly stored, and are issued for use to identified personnel. It is vital that whatever equipment is selected for working at height, it is assembled and installed in line with manufacturers’ instructions. Equipment should also be inspected regularly for signs of deterioration. Where the safety of work equipment depends on how it is installed or assembled, e.g. scaffolding, it should be inspected in place before it is used. Where work equipment is exposed to conditions causing deterioration that could lead to a dangerous situation, such as high winds for example, it should be inspected at suitable intervals and each time exceptional circumstances occur that could jeopardise its safety. According to a report in The National, 52 construction and contracting companies and consultants from Abu Dhabi Municipality were fined in the first quarter of 2017 alone for breaches of safety rules. Any organisation which is found to be non-compliant with relevant safety rules can face fines of between Dh10,000 and Dh40,000 according to the nature of the offence committed. In addition, construction sites can face closure. Recent years have also seen several reports of scaffolding coming away from buildings and collapsing in the capital, while in February in Ajman, the collapse of scaffolding resulted in damage to several vehicles. In the same month, one person was injured and a hotel building was damaged when high winds caused a crane to collapse.